Basil’s neon was designed and built in my first year. 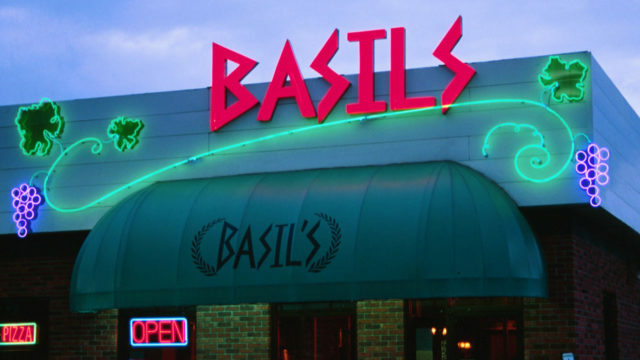 Located beside a gas station, Basil’s needed distinction from it’s surroundings. Large (4 feet) red channel letters filled with Ruby Red neon tubes boldly indicate Who.. Fluid spiral vines & grape clusters communicate the creativity and quality found inside .. “BASILS” letters, grape clusters, and leaf extend beyond the edge of the facade creating depth and movement as the viewer involuntarily explores the scene. The right end grape cluster is visible from the building’s adjacent side, enticing customers to venture around to the front facade and in the door! 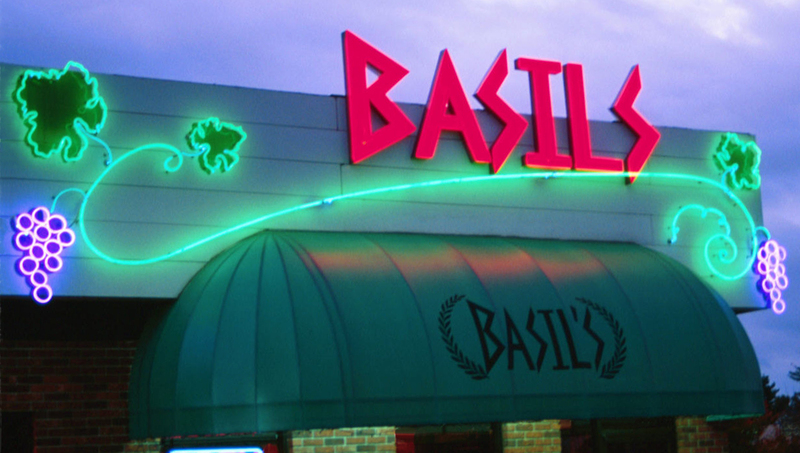 All Basil’s neon tubes are of the “classic” variety meaning that the glass is colored rather than clear. Classic glass is considerably more costly and requires twice the effort to “bend”. Classic creates the richest colors in neon…….. Basil’s, across the street from Asheville Airport, serendipitously became a visual landmark from the air, welcoming flights to Asheville……….